Inner Harbour Walking Tour: Every Hour! Join us as we explore Victoria’s Inner Harbour and discover more about BC’s maritime heritage and culture! 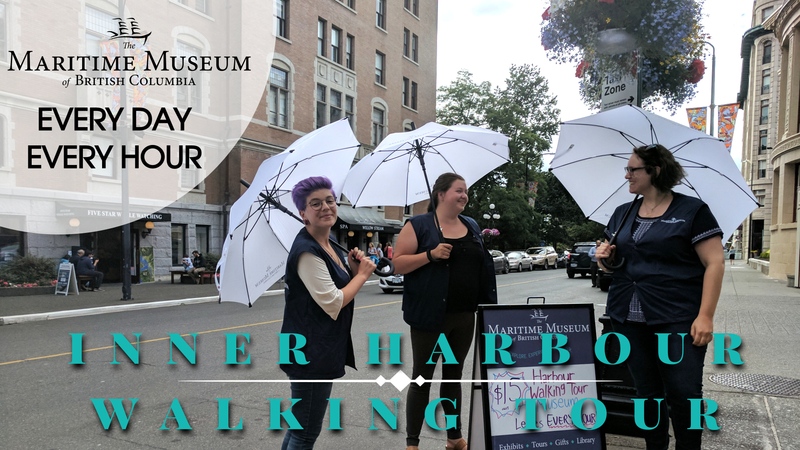 The tour starts at the Maritime Museum of BC and go around the Inner Harbour, up Wharf St., through Bastion Square, down Government St., and back to the Museum (Inner Harbour Tour Map). It runs for about an hour and includes the cost of admission. This ticket is valid for any (1) tour time you’d like to join us on… no reservation required! Tours run daily (May 22 – August 29) at 10:15 AM, 11:15 AM, 12:15 PM, 1:15 PM, 2:15 PM and 3:15 PM. Contact us at programs@mmbc.bc.ca or 250.385.4222 for more details.